For other ships with the same name, see HMS Pembroke. HMS Pembroke was a 60-gun fourth rate ship of the line of the Royal Navy, built at Plymouth Dockyard to the draught specified in the 1745 Establishment as amended in 1752, and launched on 2 June 1757. Pembroke was converted to serve as a hulk in 1776, and was eventually broken up in 1793. For her first two years Pembroke was captained by John Simcoe, the father of John Graves Simcoe who became the first Lieutenant Governor of Upper Canada. When the elder Simcoe died in 1759 he was replaced by John Wheelock who served as captain for the remaining seventeen years of Pembroke's active service. Thomas Bisset served as ships master during her commissioning, then responsibility passed to James Cook, who would later become the first European to reach the eastern Australian coastline. Cook served as master until 1759 with duties then devolving to John Cleader. Pembroke saw service in the North American theatre of the Seven Years' War, including the Siege of Louisbourg under Captain Simcoe, and the Capture of Québec under Captain Wheelock, both with James Cook as master. In advance of the latter battle, the ship played an important role charting the approaches to Québec up the St. Lawrence River, so that the main fleet could follow. ^ a b c Lavery, Ships of the Line vol.1, p174. ^ a b Robson, John (2009). Captain Cook's War and Peace. University of New South Wales Press. ISBN 9781742231099. Cook's Bay is the southernmost bay of Lake Simcoe in Ontario, Canada. It was named by John Graves Simcoe, the first Lieutenant-Governor of Upper Canada, for James Cook, who had served as master aboard HMS Pembroke in 1759 under the command of Captain John Simcoe, the Lieutenant-Governor's father. Most of the southern part of the bay is within the jurisdiction of Georgina, a town in the Regional Municipality of York. Its western end is in Simcoe County, and a small portion from the mouth of the Holland River to the Simcoe County border is within Bradford West Gwillimbury. The largest community on the shores of the bay is Keswick. HMS Barfleur was a 90-gun second-rate ship of the line of the Royal Navy, designed by Sir Thomas Slade on the lines of the 100-gun ship Royal William, and launched at Chatham Dockyard on 30 July 1768, at a cost of £49,222. In about 1780, she had another eight guns added to her quarterdeck, making her a 98-gun ship; she possessed a crew of approximately 750. Her design class sisters were the Prince George, Princess Royal, and Formidable. She was a ship of long service and many battles. HMS Monmouth was a 66-gun third-rate ship of the line of the Royal Navy, and was likely named for James, Duke of Monmouth. She served from 1667 to 1767, winning ten battle honours over a century of active service. She was rebuilt a total of three times during her career—each time effectively becoming a completely new ship. HMS Somerset was a 70-gun third-rate ship of the line of the Royal Navy, built at Chatham Dockyard to the draught specified by the 1745 Establishment, and launched on 18 July 1748. She was the third vessel of the Royal Navy to bear the name. Somerset was involved in several notable battles of the Seven Years' War and the American Revolutionary War. 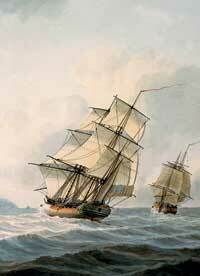 She was wrecked in a storm in 1778 when she ran aground off of Provincetown, on Cape Cod, Massachusetts. HMS Prince was a 100-gun first rate ship of the line of the Royal Navy, built by Phineas Pett the Younger at Deptford Dockyard and launched in 1670. HMS Oxford was a 54-gun fourth rate ship of the line of the Royal Navy, built by Francis Baylie in Bristol and launched in June 1674. Her guns comprised twenty-two 24-pounders on the lower deck, with twenty-two large sakers (8-pounders) on the upper deck and ten smaller sakers (5-pounders) on the quarter deck.